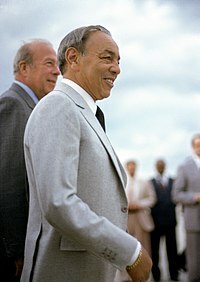 King Hassan II (Arabic: الحسن الثاني‎, MSA: (a)l-ḥasan aṯ-ṯānī, Darija: el-ḥasan ett(s)âni); 9 July 1929 – 23 July 1999) was King of Morocco from 1961 until his death in 1999. He was born in Rabat. He was the eldest son of Mohammed V, Sultan, then King of Morocco (1909–1961), and his second wife, Lalla Abla bint Tahar (1909–1992). Hassan was known to be one of the most strict rulers of Morocco. Hassan died of natural causes in Rabat on 23 July 1999, aged 70. ↑ "MOROCCO13". www.royalark.net. Retrieved 2018-02-24. This page was last changed on 21 November 2018, at 14:08.